Carpeting has started. Progress continues on the interiors. Remaining outside work - some bricklaying, painting, and paving - is being done around the rains. Carpet, paint, wall coverings, millwork, glass, bricks... 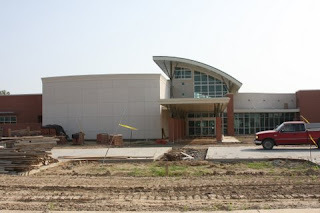 The various subcontractors are doing their part to make this a wonderful library for the Lafayette Parish community. Landscaping will be bid out in August. The Furniture bids will open on August 12th. We are eager to see the finished product! Enjoy the slideshow below from photos taken during the site visit of August 7th.